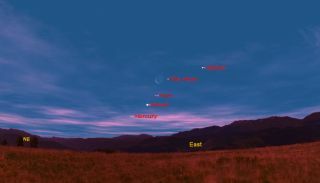 This sky map of the pre-dawn sky shows the Memorial Day alignment of four planets near the moon on Memorial Day weekend, Monday, May 30, 2011 at 5:30 a.m. local time in the United States. The unusual month-long convergence of four planets in the pre-dawn sky is nearing an end, as the planets begin separating from each other and going their separate ways. But one final series of meetings is on tap for this Memorial Day weekend. Between Sunday and Tuesday (May 29 and 31), the planets Jupiter, Venus, Mars and Mercury will appear in a grouping with a bonus visitor: the moon. Weather permitting, skywatchers can look low to the east-northeast horizon about a half hour before sunrise and see the four planets arrayed in a line. The sky map of the four planets here shows how they will appear from mid-northern latitudes in North America on Monday (May 30). But actually seeing all four planets is something else altogether. Those blessed with clear skies will certainly see Jupiter, hovering about 15 degrees above the horizon almost due east. Shining about twice as bright as the brightest star in the sky (Sirius), Jupiter can be easily seen through the bright morning twilight as a silvery, non-twinkling "star." Much farther down to Jupiter's lower left will shine an even more brilliant planet: Venus, which has been a dominant object in the morning sky since last November, but in recent weeks, has dropped very low into the pre-sunrise glow. Only its great brightness (it shines about five times brighter than Jupiter) allows it to still be seen despite its low altitude and the bright sky background. Lastly, below and to the left of Venus is Mercury, which although shining much brighter than Mars, probably will not be visible even in binoculars because of its very low altitude – only 2 degrees above the horizon. Those who live south of the equator, where the planets have been climbing higher in the eastern sky and rising in a darker sky, all four planets have been putting on a great show all during May and will continue to be well seen into the final days of this month. On Monday morning, the crescent will appear about half as thin (about 6 percent illuminated ) and only about half as high up as on Sunday. It will have moved far off to Jupiter's left, but will still be high above and to the right of Venus. The real challenge comes on Tuesday morning, when the crescent will have shrunk to a mere hairline, just 2 percent illuminated. It will then be only about 36 hours from new phase, and 5 degrees to the left of Venus. You may need binoculars to pick up the moon in the bright twilight glow. Jupiter will continue rising several minutes earlier each morning, slowly getting higher and more prominent in the days to come in the morning sky. On the other hand, Venus has been slipping slowly down into the sunrise fires. It should still be visible for another five or six weeks, albeit very low to the east-northeast horizon about a half hour before sunrise before finally disappearing into the sun's glare for the summer. Mars, like Jupiter is moving away from the sun, although more slowly; don't expect to readily see it in the morning sky until sometime during July. By August, it will be an easy object to see, rising before the break of dawn. And little Mercury will rapidly sweep into obscurity in the coming days, passing behind the sun (called a superior conjunction) on June 12 and reappearing early in July for evening viewers. If you snap photos of the planetary alignment by Mercury, Venus, Jupiter and Mars near the moon and would like to share them and your experience with SPACE.com for a possible story or gallery, contact managing editor Tariq Malik at: tmalik@space.com.